Elite Sports Tours is headed to Florida to see the Toronto Maple Leafs this winter with a double header vs the Tampa Lightning and Florida Panthers in an amazing winter hockey road trip! Join other fans for this popular hockey road trip to Florida to see the Toronto Maple Leafs in action. 5 days and 4 nights in Florida with two hockey games in January! 2 Nights Hotel (January 16-18) at the Sheraton Tampa Riverwalk Hotel - walking distance to Amalie Arena. 300 Level to see the Toronto Maple Leafs at Tampa Bay Lightning Thursday January 17th. 2 Nights Hotel (January 18-20) at the DoubleTree by Hilton Hotel - walking distance to BB&T Center. 100 Level to see the Toronto Maple Leafs at Florida Panthers Friday January 18th. *On Ice Group Photo after game at BB&T Center. Packages do not include flights - only shuttle transportation from Tampa to Sunrise Florida. and flying out of Fort Lauderdale–Hollywood International Airport or Miami International Airport. All of our trips are hosted by Elite Sports Tours representatives who will be on site during the trip and to assist with the shuttle transfer and check-in. 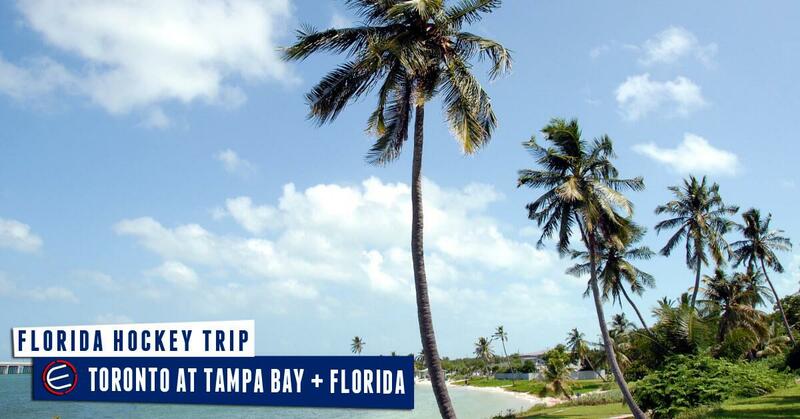 • BOOK YOUR TORONTO MAPLE LEAFS AT FLORIDA HOCKEY ROAD TRIP & YOU ARE ALL SET! We email you confirmation forms & you pick up everything from our staff on site the day of the trip. Toronto Maple Leafs at Florida Hockey Road Trips with Elite Sports Tours is the only way to go! No hassle of finding Toronto Maple Leafs tickets to the game for your group or finding a ride from Tampa to Florida to the game. We do all the work planning the trip for your group and making it simple for you! just get your group together and give us a call at Elite Sports Tours. To make a reservation $250 non-refundable deposit per person is required for our Hockey road trips. Unfortunately there will be no refunds, so we strongly recommend purchasing Cancellation Insurance should you believe there be a significant reason you may not be able to attend this event. The remainder is due 60 days prior to departure. - We are not responsible for traffic and ask that all guests arrive for departure and return in appropriate time.